June Black (third from the right) among colleagues at Chagoya’s exhibition. Courtesy of June Black. June Black sits in a quiet meeting room in the back of the Jordan Schnitzer Museum of Art (JSMA). Black is kind with youthful charm, dressed in a bright pink floral scarf that mirrors the vibrancy of her smile when she talks. She explains that she is hosting an artist later that afternoon — she’s excited to show off the way they organized his gallery. Black is a curator at JSMA, or rather, she’s the Associate Curator for Academic Programs and the Arts of the Americas and Europe. She keeps herself every bit as busy as the title implies. “It’s the world’s longest job title,” Black says. 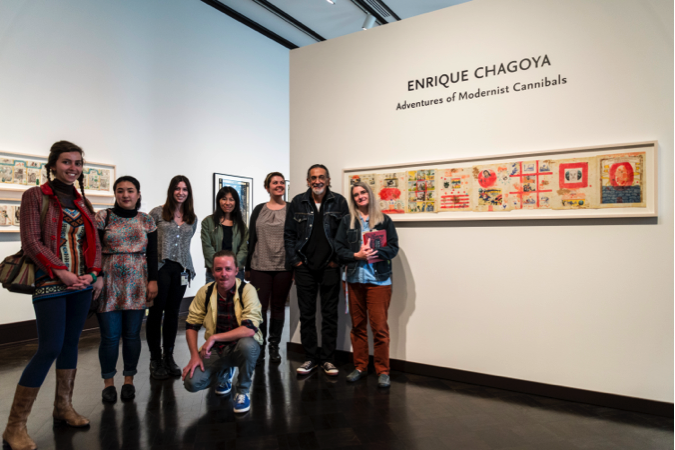 “I do a lot!” Black curates European and Latin American art, works with local artists to have their work displayed, and runs the academic programming in partnership with University of Oregon classes. Though she chose an in-state college for her undergraduate education, Black soon found herself being drawn away from her home state, and even home country. In 2008, she decided to study abroad in Bilbao, Spain. During her time there, Black attended an exposition at the Guggenheim Museum called Russia! which covered nearly 900 years of Russian art that had never been shown outside of the country before. Black fell in love with exhibition, the catalogue, and the way the artwork was interpreted in the galleries. “I decided at that point, though I didn’t know much about curating at that point either, that I’d rather pursue that than pursuing my own art career,” she says. Black went on to return to Spain to study abroad for a year to work on her Spanish degree and graduate school applications to get a degree in art history. “I have no words, Spain is just so beautiful,” Black says. Black chose to the University of Oregon in hopes of working with Andrew Schulz, an expert on Spanish Enlightenment era painter-printmaker Francisco Goya, who taught at the University at the time. Though she did not end up studying under Schultz, she found valuable opportunities at the University of Oregon while earning her degree. Black went on to receive a grant to study at the Modern Art Museum in Valencia, Spain, and work an internship at the JSMA that would open the door to her future career. Chagoya (center) visiting JSMA gallery. Courtesy of June Black. 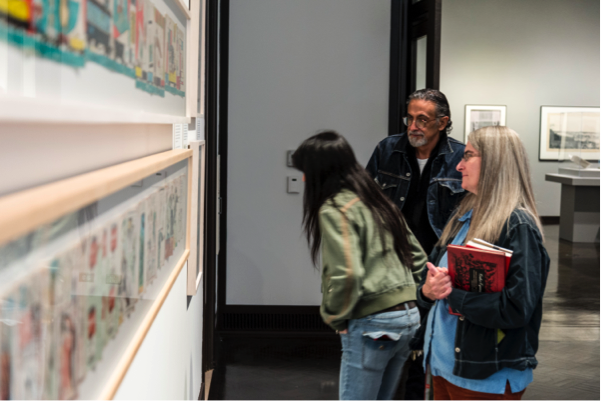 In addition to the paintings and prints of Mexico-born Chagoya, Black was also involved in bringing the Voces de Mis Antepasados/Voices of My Ancestors cut paper craft exhibition of Catalina Delgado Trunk to the JSMA. This show is currently going on alongside Chagoya’s in the Harold and Arlene Schnitzer Gallery through early December. Black says that visiting museums and looking at artwork is a transferrable skill to any field that someone may go into. “And I’m not just saying this as a person who likes art,” she says. Black emphasizes close reading of art as a valuable ability that will assist in the close reading and understanding of other topics, including science, business, and journalism. Black encourages students to visit the JSMA, as it is free for students to visit. Many universities across the United States lack the resources or accessibility that is offered at the University of Oregon. “I think this is one of our University’s gems,” Black says. The Jordan Schnitzer Museum of Art is located on the University of Oregon main campus at 1430 Johnson Lane in Eugene, Ore. The museum is open to members of the public on Wednesday 11:00 AM-8:00 PM and Thursday-Sunday 11:00 AM-5:00 PM. Admission is free to University students and staff.